The Curse of Naxxramas isn’t one of those flash, bang, now-you’re-a-frog hexes. It’s more of a slow-burn spell, unfolding its horrors week-by-week to Hearthstone players. This week’s wing is the Construct Quarter: a gunge-powered laboratory patrolled by stitched-together new minions. “Kel’Thuzad’s more scientifically minded minions assemble undead abominations amongst sparking tesla coils,” write Blizzard. Disassemble all four and you’ll be able to shuffle two new legendaries into your collection: Feugen and Stallag. But early reports suggest you’ll need a taunt-heavy deck to succeed. The Construct Quarter costs £4.99 / $6.99, or 700 in-game gold. Or you can pay a single fee of £13.99 / €17.99 / $19.99 – 2800 gold – for every wing of the single player campaign. Next week’s Frostwyrm Lair will be the last of five. How’ve you found the first three? 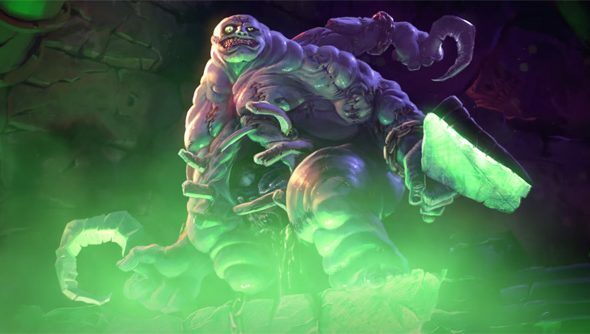 Curse of Naxxramas has brought Hearthstone its highest revenue ever – despite payment issues with the Plague Quarter.